Sean Dyche hailed midfielder Joey Barton after another influential display at Huddersfield. Barton played a key role in the 3-1 win at the John Smith’s Stadium on Saturday, with his workrate in particular catching the eye. And Dyche feels it is a great credit to the one-cap England international that, at the age of 33, he retains that will and desire to get about the pitch: “Him and Jonah I thought were excellent – the reading of the game, the will and desire. “Players, when they get older, especially when they’re good players like Joey, they can morph into something different where they want the ball and the work to get the ball softens. “His doesn’t. His desire to work for the team and do the ugly side of the game as well as the nice side of the game – he’s got a very healthy mixture to his performances and he’s done well. “And I think Jonah’s done well, we’ve got Dean Marney coming back, Fredi Ulvestad’s had little patches where he’s done well, he’s still under the radar. 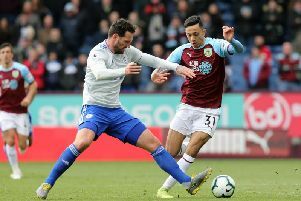 Barton is one of a number of Burnley players who have experienced promotion from the Championship before, and Dyche said: “There’s a lot of experience out there. “The players have been through a lot over the last three and a half years that I’ve been here – not all of them, some have joined this season, but most have been with me for a while now. The likes of Michael Keane and Andre Gray are aiming for their first promotion, and Dyche added: “Keano’s a young centre half, he’s having a fantastic season developing, learning, understanding from me, from the staff, from his own team-mates. “Andre Gray is relatively new to the professional side of it. He didn’t have the usual stepping stones for young professional footballers, he’s still learning the game. “People forget he’s only 24 and to come into the (professional) game at 20-21 and have that accelerated learning and to be doing what he’s doing is fantastic.